In the near future, many of the “senior gods” get married, the “golden bachelor” George Clooney who has seized Hollywood for several years will marry lawyer Amal Alamuddin at the end of September; “the pirate captain” Jonny Depp will also marry with Amber Heard this year. The lawyer Amal Alamuddin, actress Amber Heard, the two of them are not as popular as men, how can they attract those top proverbial gods? There are various reasons, but the most important one is that they all have good fashion taste on wearing. Would like to vanquish men? Start with your dress! George Clooney attended the Fight Night in Italy charity party with Amal Alamuddin. Amal wearing a black tee dress which is grandeur and grace. She seems no less attractive when stand near Clooney. A pair of chandelier earrings adds more sparkly on her outfit. Amal Alamuddin wandering on the street alone, the simple dust coat which is the most prevailing items this season match well with the brown pant. The special shinning necklace is attractive. 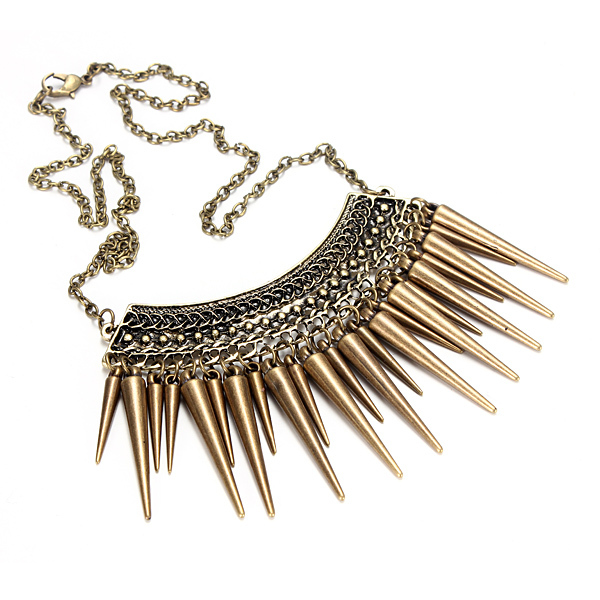 If you like this style of necklace, then rivet tassel short necklace will be your sake. Jonny Depp appear with his fiancée Amber Heard. The black full dress and the delicate charming red lip which make Amber steal the scene than Jonny. Every time when she appear on the snap, the earrings and fashion necklaces she worn seems just perfect with every outfit.